Medium density fiberboard, commonly abbreviated as MDF, is a man-made wooden material used for a variety of building purposes in and outside the home, such as flooring and furniture. MDF is made from wood fibers that are glued together with heat and pressure. MDF is easily recognizable in your local home improvement store as it comes in packs of smooth, uniform wooden panels, and is frequently worked with due to its unique fiberboard properties, that make it ideal for certain situations in comparison to other wood products. MDF board does not have a natural grain like most wood, because it is a manufactured wood product rather than a natural one. 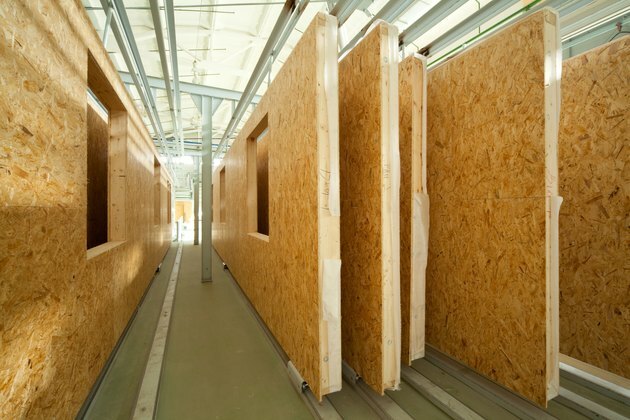 Because medium density fiberboard is fused and glued into a uniform panel, it is significantly easier to saw, lacking knots or a grain to consider. It can be cut in any direction and made into any shape – and given that the edges of the MDF turn out very smooth if properly sharpened tools and the correct techniques are used when working with the material, MDF is often used when a nice, clean look is desired from the finished product. MDF is significantly less expensive than real wood, and is easier to stain and smooth, but at the cost of lacking the imperfections that make real wood feel luxurious. Unfortunately, medium density fibreboard has properties that necessitate care and attention when working with the material. Working with MDF can potentially be hazardous to your health, so you must work in a well-ventilated area and wear proper eye and nose protection when cutting it. MDF is made through the use of urea-formaldehyde, which, over time, is released into the air from the wood in low concentrations. This is why MDF is often regarded as carrying a distinct smell. The formaldehyde can irritate your eyes and respiratory tract and can aggravate your allergies or other respiratory issues you might have, especially since cutting MDF also releases a lot of dust. Use this product with caution. MDF is strong, stiff and heavy; therefore, it is a little complicated to work with. The high glue content in the MDF causes steel cutting tools to dull easily and quickly. Thus, it's best to use carbide tools when working with MDF. Use nails and screws to attach MDF pieces together; however, because of its strength, the wood may split and the fasteners will not hold well. To prevent this from happening always pre-drill holes for nails and screws.